Metal jacket. 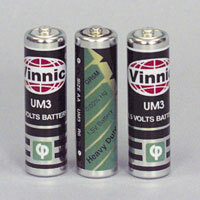 Higher quality, long-life, low priced batteries. 24 cents each for 600 pieces or more. 20 cents each for 1200 pieces or more.